October 2017 Blog Carnival – Superstitions! Superstitions can be based in mythology, folklore, or local legends. Also, superstitions can range from the mundane, such as covering mirrors after a death in the family, to the exotic, say chewing gum after dark turns into human flesh. But the one thing that all superstitions in our reality have in common is that they are not true; just malarky and hokum usually indoctrinated into children and thus continue to thrive despite the severe lack of evidence. In the world of fiction, evidence no longer matters and we can play with “real” consequences of breaking taboo. We can create mechanics to support the rules of superstitions. Superstitions provide a great way to flesh out a campaign world, can help differentiate cultures from each other. So, add some simple mechanics and give players a different tangible experience in their travels. Vyalachi, nestled at the mouth of a pass along the Wallachi river, empties into Wallachi Lake. The area between the borough and the lake is mostly swamp where the backwaters of the lake ebb and flow. Travelers are warned to beware the gloom grubs and to “clad their navel” because these swamps are notorious for plaguing the two main roads out of Vyalachia with thick mists and fogs. The fog contains a magical disease that manifests as small, grey worms or grubs and the disease is known locally as gloom grubs. It is not just a Vyalachian fashion trend to for men and women to wear corsets featuring a large, cold iron disc over their bellybutton… it is the only known preventative for gloom grubs. Those finding themselves within the fog of Vyalachia have a cumulative 10% chance to be exposed to gloom grubs every minute. See below for the PFRPG stats for the disease. No latent/carrier state; upon death small grey worms burst forth from the abdomen, subjecting everyone within a 5′ burst to the gloom grubs disease and then immediate dissipate into vapor. Anyone with cold iron covering their navel automatically succeeds in the Fortitude Save to contract the disease. This superstition is based on the Japanese superstition that Raijin (雷神, Shinto mythology), the god of storms, lightning, and thunder, would eat the navels and entire abdomens of children. Japanese parents would tell their children to hide their bellybuttons during a storm, so its origin is in preventing illness. Some people are born with with the power of the evil eye. Some people are gifted with the power of the evil eye via unspeakable means. Vyalachians fear and hunt either version of people with the evil eye. Iris color, or colors, identifies persons with the evil eye. One green and one amber eye, or heterachromia, supposedly signifies that someone has bargained for the power of the evil eye or is a descendant of someone who bargained for the evil eye. Thus superstition dictates. Vyalachians do not hesitate to burn anyone with even different shades of brown in their eyes at the stake. Even more concerning, villagers have put infants to the torch. Consequently, many mothers who give birth to children with heterachromia will secret them away with family far removed. However, in reality, heterachromia is just a genetic anomaly. Furthermore, anyone with any eye color can have the power of the evil eye. The evil eye inflicts a minor curse on unprotected people. Often the person using the evil eye are not aware of their power. The evil eye comes in two varieties, lesser or greater. Players may select the Evil Eye as a regional regional trait. You have either inherited the ability or bargained for the ability to inflict minor curses on those that wronged you. -2 decrease to an ability score (minimum 1). -1 penalty on attack rolls, saves, ability checks, and skill checks. 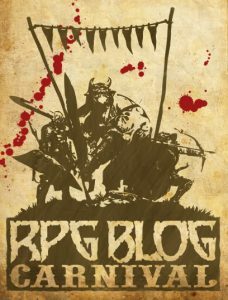 This month’s RPG Blog Carnival is hosted by Of Dice & Dragons.